Hawks Crag under cut in the Buller Gorge, beside the Buller River at Dee Point. State Highway 6 (SH6). 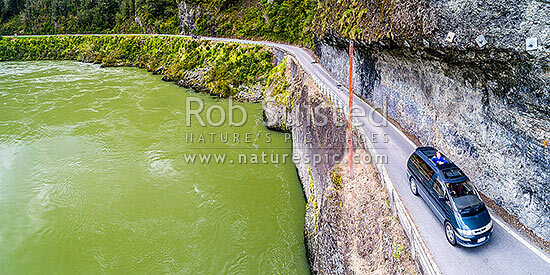 Aerial panorama of car passing underneath this narrow section, Westport, Buller District, West Coast Region, New Zealand (NZ), stock photo.